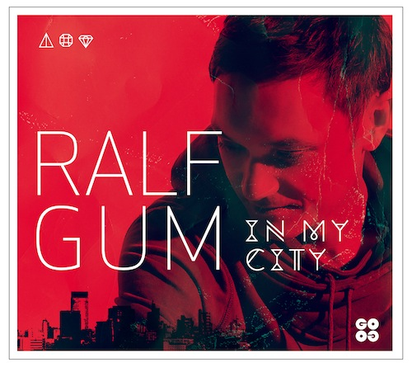 Jumping straight in on the No.1 spot on iTunes South Africa on day of release and already one of the most celebrated albums of 2014 in the motherland, house veteran DJ/producer Ralf GUM unleashes his third album, ‘In My City’, unto the rest of the world on his GOGO Music label. Moulded with his soulful, organic, afrcocentric signature sounds, the album is a tapestry of beautifully weaved songs and features local South African and international artists - established and upcoming. These include artists such as Hugh Masekela: "My love for his tone on the trumpet never faded," says Ralf, who grew up listening to Hugh. Many years later upon meeting, the two clicked instantly and whipped up two songs for the album: the love song 'With Her Hand' and voices the topic of over population on 'In The City'. Also on board is UK soul architect Omar with 'Love Core' and Londoner Dele Sosimi (Fela Kuti, Femi Kuti) on the afrobeat outing 'Bi 'na ba n'jo'. Monique Bingham lends her distinctive vocal tones to 'The Pap'. Together Ralf and Monique have penned previous hits such as ‘Kissing Strangers’, which was the best selling soulful house tune of 2008 and 2012’s ‘Take Me To My Love’ was an official chart #1 in South Africa. There is also a refreshing assemblage of newer generation artists, including Lee Bling on ‘The Best Thing’. Portia Monique sings on the first single ‘Free (Is All I Wanna Be)’, which instantly entered rotation on most South African radio stations and supported by global DJs including Tony Humphries, among others. South African actress and Osunlade collaborator KB makes a return to house music on ‘My Angel’, while previous collaborators Parisian Jocelyn Mathieu (Masters At Work) and Kafele of the 2010 track ‘Complicated’ return. Ralf Gum: “In My City” is a very personal project for me. I intentionally put the skyline of Johannesburg on the cover as a tribute, South Africa is the most vibrant dance nation I know globally. I am grateful to be a part of its heartbeat and feel that I spiritually and musically now live in a place which I really call home. I am #InMyCity. ‘In My City’ follows in the traditions of his two previous albums, his debut ‘Uniting Music’ in 2008 and the South African gold-selling, ‘Never Leaves You’ in 2012. Ralf also owns the record label GOGO Music which was set up in 2001. In 2003 Ralf initiated the GOGO Music radio-show, now one of the most popular broadcasts within the house community, aired weekly by more than 50 FM- and internet-stations around the globe.